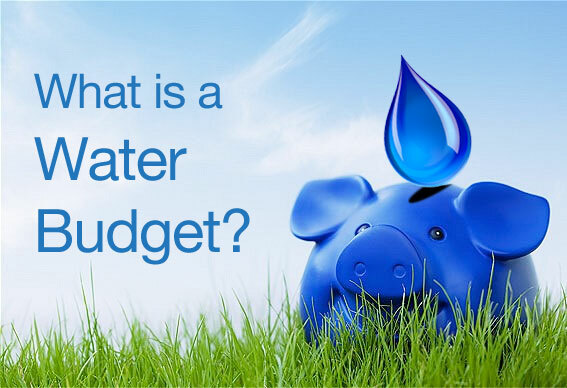 We need to know more about aquifers but long-duration pumping tests are expensive. A number of smaller, short-duration tests in multiple locations could provide information that can be scaled up. Additional observation and monitoring of wells is required to better understand water levels, especially those subject to seasonal variation. Well quality measurements in residential wells near ocean shores are needed to help monitor changes in salinity. 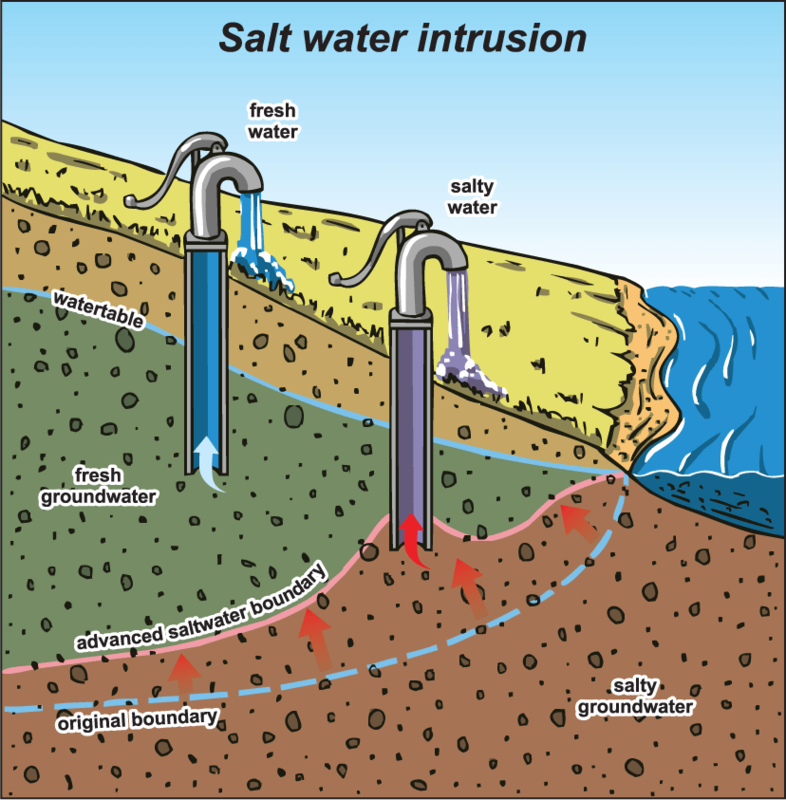 Saltwater intrusion may be localized or focused along discrete fractures rather than across an aquifer – additional monitoring wells away from shore may not provide much useful information. The number of survey respondents was very low. More information is required to better understand water use by industry, agriculture, business, residents and tourists. 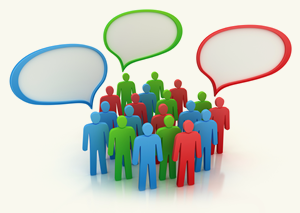 The following discussion addresses the most important data gaps in the conceptual model and presents a prioritized listing of data collection that could be used for future assessments. 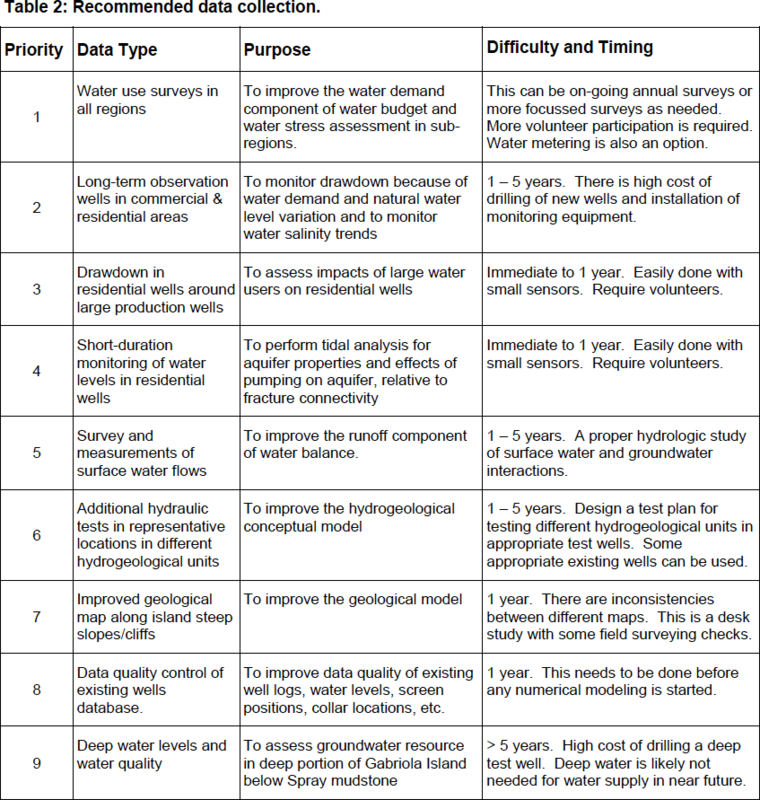 This recommended data would improve the hydrogeological conceptual model as well as water budget accuracy. The costs of collecting data vary and, as a result, some of the suggestions may be prohibitive depending on budget availability; others can be done at relatively low cost and provide good value. A summary of prioritized data collection suggestions is provided at the end of this section (Table 2). Pumping tests of new test wells are needed to obtain additional hydrogeological unit properties. However, the cost would depend on the type of testing selected because of the drilling and equipment required. For example, long-duration pumping tests are preferable because they impose a larger stress on the aquifer and provide a better estimate of hydraulic parameters, but these tests are also more expensive. In contrast, short-duration pumping or injection tests are less expensive and obtain results that can be scaled up and that show the relative differences of transmissivity between different locations and hydrogeological units. In this case, a number of smaller tests in multiple locations would prove more useful than one or two large tests that would not be representative of the whole island and would not, therefore, add significantly to the existing model. Tidal analysis can be done but it requires a second test to determine storativity property of fractured rocks, before a reliable transmissivity value can be estimated. A different test can be done in the same well (pumping test, slug test) to estimate transmissivity and the tidal analysis can then be used to estimate the storativity value. All methods of testing have limitations and there is some uncertainty in the calculated values of hydraulic parameters. On Mudge and DeCourcy Islands, more static water level measurements are needed from wells. These wells should be surveyed or their locations matched closely to nearest topographic contour to obtain the needed measurements. On Gabriola Island, a large number of static water levels (of varying accuracy) have been measured near the ground surface, however, there are no hydraulic head measurements at large depth and below the Spray mudstone layer. New observation wells could be installed with screens below and above this unit to determine groundwater conditions below the unit. Additional observation wells would also be useful in areas with high water demand in the western part of Gabriola Island, south of Descanso Bay and in eastern part of the island. 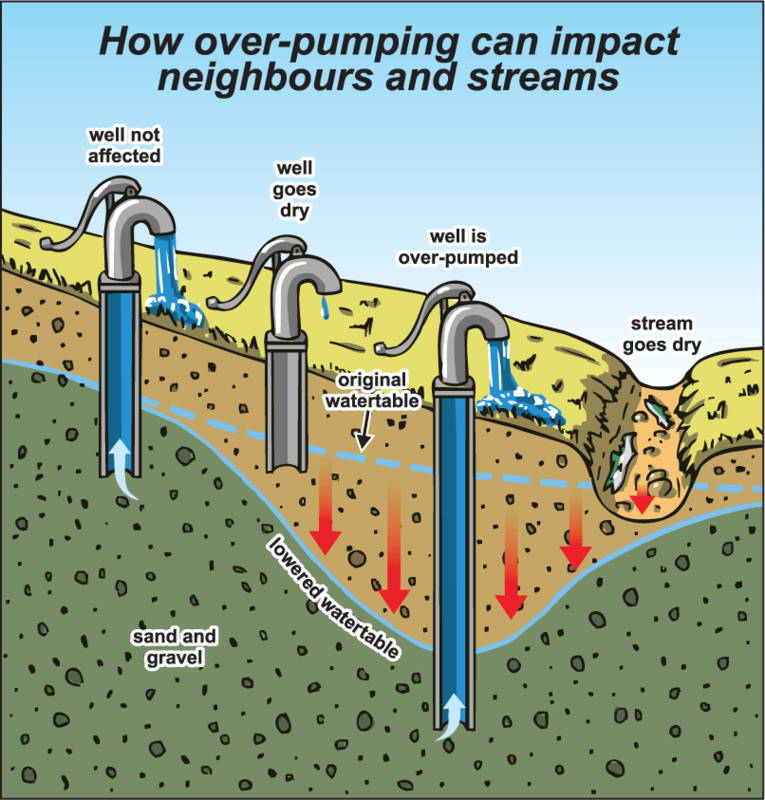 Unused residential wells could be used in place of dedicated observation wells. Monitoring could be done as short-term, frequent measurements to observe the effects of local drawdowns and recharge after rain events to improve understanding of the different regions. Also on Gabriola Island, some residents are concerned about effects on their wells by commercial water users. If commercial extraction continues in the future, some additional effort should be made to monitor the largest commercial water users using nearby residential wells or new observation wells. If there is any effect, the drawdown could be detected in residential wells that are closest to the commercial pumping wells. The monitoring would need to be done over a long period of time—at least one year—to observe the seasonal effects of water table variation. Salt water intrusion should be monitored in many residential wells near ocean shores and should be compiled from reports containing well water quality measurements. More long-term observation wells may not detect salt water intrusion because it may be localized near pumping wells in the form of “up-coning” salt water. The fresh-saltwater interface is very steep, and the mixing zone is very narrow. 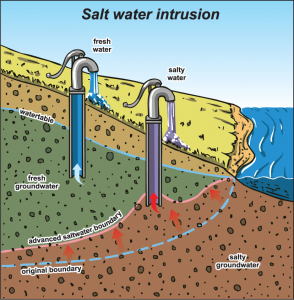 Therefore, observation wells away from shorelines would not detect salt water intrusion occurring near shores. The saltwater intrusion may be focused along discrete fractures rather than across the aquifer. Near-shore wells will be connected differently to the ocean and some wells may draw in salt water long time before nearby wells experience any change in salinity. To determine the amount of useful water storage, some effort could be made to verify the depth of fresh water under the islands and water quality variation with depth. The number of survey respondents from West Degnen Bay, Northumberland, and Mudge Island is very low. To acquire more representative information for these sub-regions, further work needs to be done with a greater number of respondents. Water usages for many commercial and farming establishments are unknown and are only estimated. Further study needs to be undertaken to target specific commercial and farming establishments to acquire reasonable water use estimates. There is insufficient data to calculate the amount of drainage from surface runoff and groundwater discharge. The volume of groundwater recharge to the bedrock aquifers from surface water needs to be quantified because current estimates are uncertain. Small streams do not have any monitoring devices or any recent observations. Some spot measurements and gauges would be very useful for understanding surface-groundwater interactions.